Karl Held gets a walk. Karl Held raises to 250,000 and Bart Lybaert shoves all in for 380,000. Held calls. The board runs out and Lybaert earns the double up. Ben Yu raises all in from the cutoff for 650,000 and Karl Held raises from the button with , leading Yu's . "Ten ball! Corner pocket!" yells Yu's rail, consisting of Justin Bonomo, Leo Wolpert, and Tim Finne (to name a few). They get their wish as the board comes down , giving Yu a set of tens to double through Held. 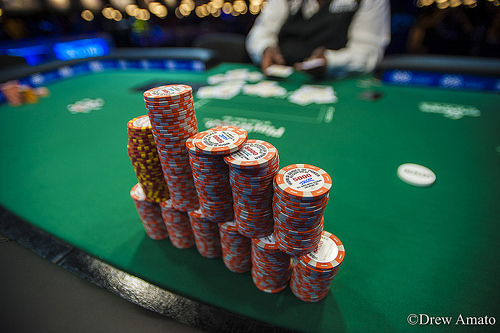 Ben Yu raises all in from the button for about 470,000 and takes down the blinds and antes. Bart Lybaert raises all in from the cutoff for about 365,000 and gets no action. Karl Held raises to 160,000 from under the gun, and Bart Lybaert moves all in from the cutoff for 1,760,000. Held calls. The board runs out and Held doubles up with a flopped set. The players are taking an impromptu break. 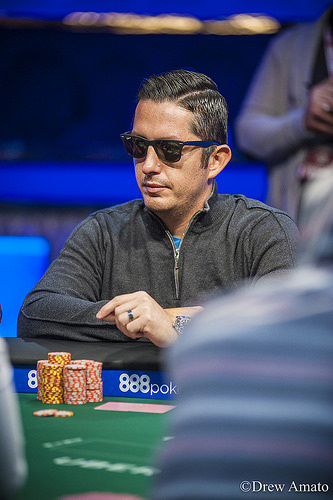 Hugo Perez goes all in from the small blind and Kyle Julius calls from the big blind. Perez has and Julius has . The board runs out and Perez is eliminated. 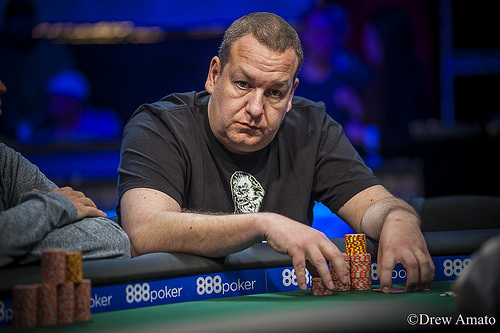 Julius is now just behind chip leader Bart Lybaert. Bart Lybaert shoves all in from the small blind and Hugo Perez folds in the big blind. Kyle Julius shoves all in for 800,000 and wins the pot. Ben Yu shoves all in from the small blind and Karl Held folds in the big blind. Hugo Perez raises all in from the button for about 650,000 and gets no action. Christian Blech calls all in for his remaining 10,000 from under the gun and Bart Lybaert shoves from the button. Everyone else folds. The board comes down , no help to Blech, ending his run in sixth place. Christian Blech moves all in from middle position for approximately 310,000 and Hugo Perez calls from the big blind for about 290,000 total. The board runs out to give Perez two pair, and he doubles up. Karl Held raises to 175,000 from the small blind and wins the pot. Bart Lybaert raises to 175,000 from under the gun and wins the blinds and antes. Kyle Julius moves all in from the button and wins the blinds and antes. Kyle Julius shoves all in from the small blind and Christian Blech folds in the big blind.